As Paris walks around on this particular Saturday before the racing card begins hanging posters and a flyer to tell fans which Advance locations to get them at, he can't help but stop and look at his surroundings. It isn't very often that you see a major company produce high-end promotional souvenirs for a short track and its fans. But when you get your ticket ripped and walk through the gates of Bowman Gray Stadium in North Carolina, things are a little different. Hanging upon the facade of the old original press tower on the backstretch is a pretty special poster. 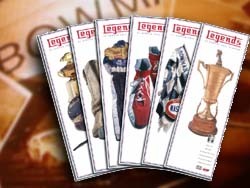 The poster, which dawns a vintage helmet and trophy from track legend Bobby Myers, is titled “The Legends of Bowman Gray”. And if you look down this beautiful poster at the bottom reads Advance Auto Parts. No they don't have there name tattooed across the top in day-glow colors so it stands out like a sore thumb. 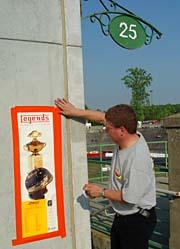 The main message of the poster reads clearly in large print at the top...“Legends”. Mike is not just a Marketing man for Advance. He is a true racing-guy. Paris loves the sport and the Stadium but knows that it isn't only his love for the stadium that makes this promotion work. “We do almost 80 short tracks in the country,” says Paris of Advance's Grassroots Racing program. “But this place, it is the best-run short track in the country. The fans here are as loyal a fan as you can get. I don't know if you've noticed in the grandstand, a lot of people sit in the same seats that their father and grandfather sat in. It's just a natural place to be. The fans have such an attachment to it. And there are a lot of customers indeed at this particular little short track. 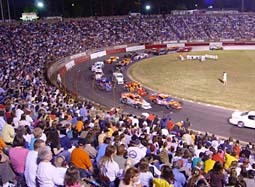 Although Bowman Gray is tucked away in the hills of Winston-Salem, it is no secret that the fan-count is the key to the ¼ mile oval's success. Good car counts are one thing, but when you pack 17-thousand people around a short track on a Saturday night, you know it is a healthy track to be involved with. “Here you are hitting 12 to 15,000 people every night. On the real good nights that number reaches about 17-thousand. At the opener I think they had 13 to 14,000 people and the promoters were disappointed. There are promoters all around this country that would be doing back-flips if they had half of that. There is a reason for that crowd. The fans here get a good show and good value for their money. Their heroes are here and those heroes are the one's they come to see. 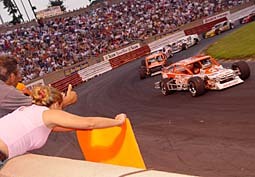 And the lasting success of Bowman Gray Stadium makes Advance's involvement a no-brainer. “Its probably one of our best programs because it is probably the strongest Short Track in the Country. I tell people all the time that there is no place in the country like it. You almost have to see it to believe it. Why it is strong is that the fans have such an attachment to it. We like the same things our customers like. It's just a natural fit. “A lot of people don't know this, but Advance was started back in Roanoke in 1932 and the first place they expanded to was right here in Winston-Salem, NC. So Advance has been here for over 50 years and the track has been here that long as well. The posters that Paris and the people at Advance have produced are the third in a series of souvenirs for the fans. Two years ago they did a poster set of the top-five most winning drivers in Stadium history. Last season they did trading cards, which were a big hit with the fans, of Advance driver Junior Miller's career and drivers from the Stadium's past and present. This year's posters are probably the slickest designed of the three year promotional schemes. Each poster includes a photo of an artifact that identifies the driver featured. Junior Miller's poster has his old drivers suit and Puddin' Swisher's has his trademark cowboy boots. 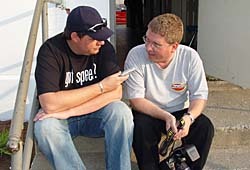 “What we did is we talked to people like the 51 guys and the Winston-Salem Journal guys and asked for suggestions on who the great Legends of this track were. We then approached the families of the people we chose and got some real neat artifacts. As Paris was hanging his final poster on his trip around the outside of the track, a fan approached him. The fan, wearing an Advance Junior Miller shirt, asked about the posters. At the same time, another older fan walked by remarking on the poster and that he remembered watching Bobby Myers race. Before the fan turned and walked away, he said “See you later Mike.” Paris said goodbye and pressed in the last staple and headed to the pit area with a smile. In that moment you could see that it was more than a job for Paris. Yes, he and the company have made personal connections with the fans of the Stadium. But for Paris it's more than that. What he shares with many who stopped to look at the posters is a passion for the sport and for the Stadium. “You have hard times and rough times but most of all this deal is just amazing. When I do my job and see that the fans and the customers are excited, my team members in the stores are excited about what I am doing, I can't ask for anything better than that. “The Legends of Bowman Gray” posters are available while supplies last for a limited time (from May until August) at select Advance Auto Parts locations throughout the Winston Salem area. Click Here to see a list of locations that the poster are available. The six posters are true collectors items. The Myers family: (from left to right) Jason Myers, Gary Myers and Burt Myers pose with the posters. The poster has Gary's father, Billy Myers' 1955 Sportsman trophy. 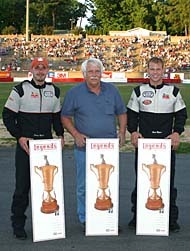 The Myers are a 3-generation racing tradition at the Stadium. (Eric Hylton Photo).